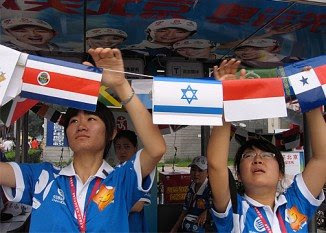 BEIJING (JTA) -- The largest contingent in Israeli Olympic history is eyeing its biggest medal haul as the 2008 Games get under way here. Two of the five medal winners in the country's Olympic history are among the 43 athletes -- nearly half females -- competing in China. Plus there are hopes for several others. Michael Kolganov, who won a bronze medal in kayaking at the 2000 Games in Sydney, was designated the flag-bearer for the opening ceremony Friday evening. Israeli President Shimon Peres, who composed a poem about the Olympics, joined Kolganov and others from the Israeli delegation at the ceremony. Arik Ze’evi is back after taking the bronze in judo at the 2004 Games in Athens. With third-place finishes in the 2007 and 2008 European Championships, expectations for him are high. Gil Fridman, who won the gold in men’s windsurfing in Athens, is not on this year's squad. But the 470 men’s sailing duo of Udi Gal and Gidi Kliger is coming off three straight bronze medals in the World Championships and a bronze in the European Championship. Israel, which has never won more than two medals in an Olympics, is also looking for hardware from its men's doubles tennis team of Andy Ram and Yoni Erlich. Ranked No. 5 in the world, Ram and Erlich captured their first Grand Slam title at the Australia Open in January, and reached the quarterfinals last month at Wimbledon. While the expectations are high, most of the athletes are making their Olympic debuts and are relatively young. "Many will continue on to the next Games,” predicted Ephraim Zinger, the Israel Olympic Committee secretary-general and mission chief. Zinger told JTA that Kolganov was chosen as the flag bearer for his "personality." A native of the former Soviet Union, Kolganov made aliyah as a teenager, eventually moving from Haifa to a Jordan Valley kibbutz. He fulfilled his military obligation by serving in the army's program for sporting excellence. "He is a kind of role model, as someone who made aliyah when he was young and became a successful part of Israeli society,” Zinger told JTA. Kolganov won the bronze in the K1 500 meters in Sydney and finished fourth in the 1000-meter race, falling just short of becoming the only Israeli to earn two medals in a single Olympics. Not all the Israeli athletes were on hand for the opening ceremony. The Israel Olympic Committee is flying in the competitors according to the date of their events and a formula for calculating the amount of time needed to acclimate to a new time zone. Zinger says the Israelis do not have any extra security accommodations in China. Eleven Israelis were murdered by Palestinian terrorists at the 1972 Games in Munich. “We live in the Olympic Village like all the other athletes, and we rely on the experience and expertise of the local authorities to do their best so we can compete peacefully and go back safely,” said Zinger, who noted that the Israel Olympic Committee has invested some $20 million over the past four years in preparation for the Beijing Olympics. “The Olympic Security Department made an assessment and drew up a list of countries with the most sensitive security issues, and I can tell you we aren’t the only ones, and we aren’t at the top of the list either,” Zinger said.